WE ARE YOUR "FOREVER MEMORIES" TRAVEL ADVISORS! Wenck Travel is committed to helping clients make travel arrangements as smoothly, efficiently, economically, and stress-free as possible. 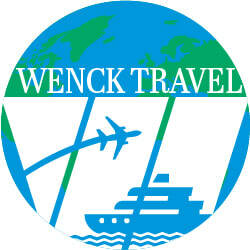 Wenck Travel is a full service travel agency which focuses on your vacation vision. We relieve the stress of scouring the internet for deals, offer choices within your guidelines, and make sure that all your questions are answered and expectations are not only met but exceeded. We want to become your "Forever Memories" travel advisors. Explore our fantastic trips, tours, and destination guides! Set the course for relaxation aboard one of our luxury cruise options! We offer amazing travel specials to exotic and familiar destinations worldwide!